When a traveler isn’t traveling, they’re probably thinking about traveling. 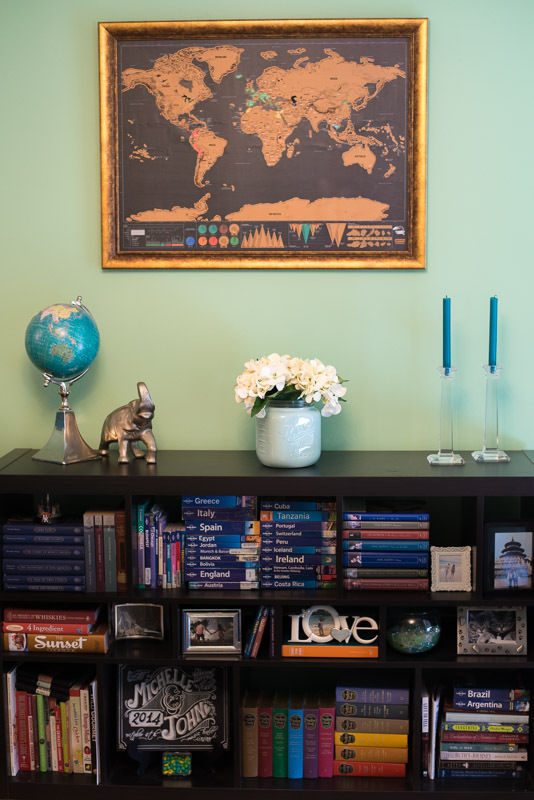 If you’re not out exploring the world, one of the nicest things is to have a little bit of travel inspiration around you at home. 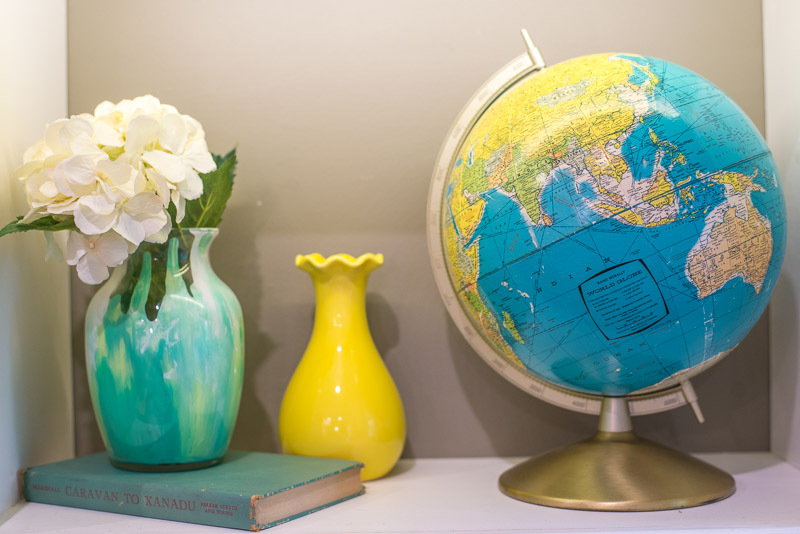 Here are a few ideas of how to decorate your space with a travel theme! 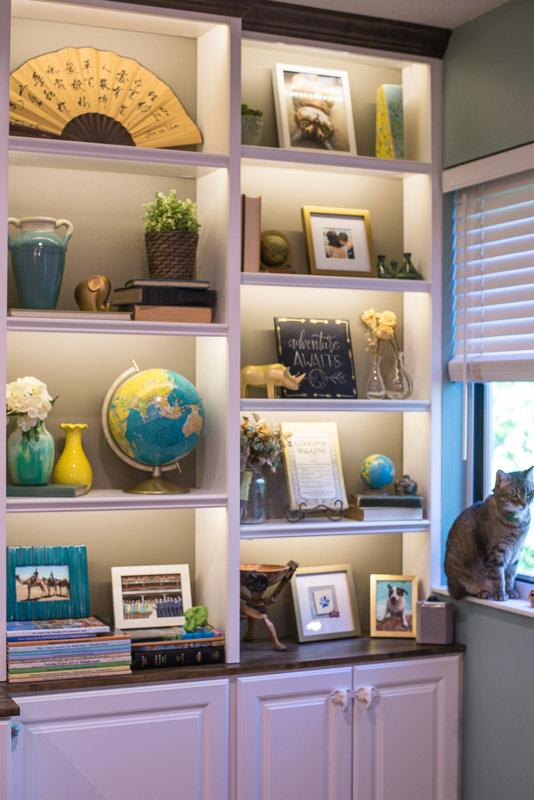 These are all photos from my own house, and while I know it’s not everyone’s style, these decorations might give you some inspiration! 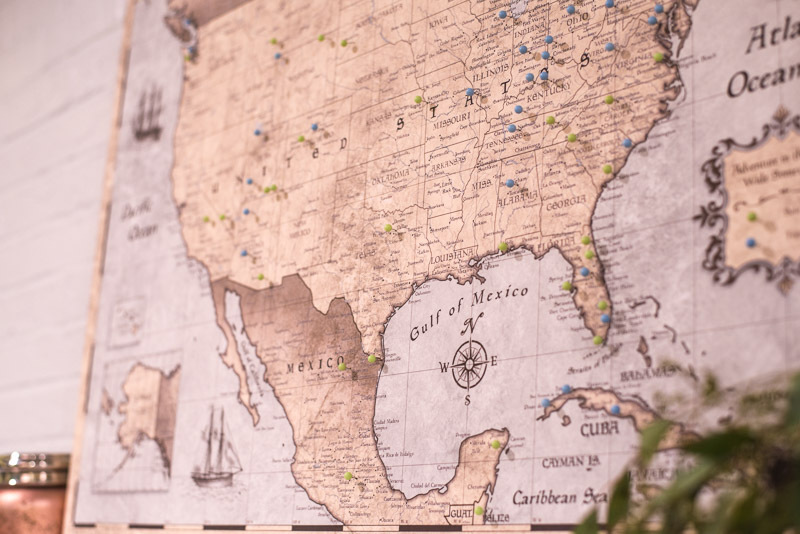 Include Maps– Scratch off, pin maps, vintage or new, it doesn’t matter! One of my favorites is my sturdy canvas map of the United States from ConQuest Maps (a company based out of Columbus, Ohio). You can customize the text (like I did, paying tribute to my blog name! 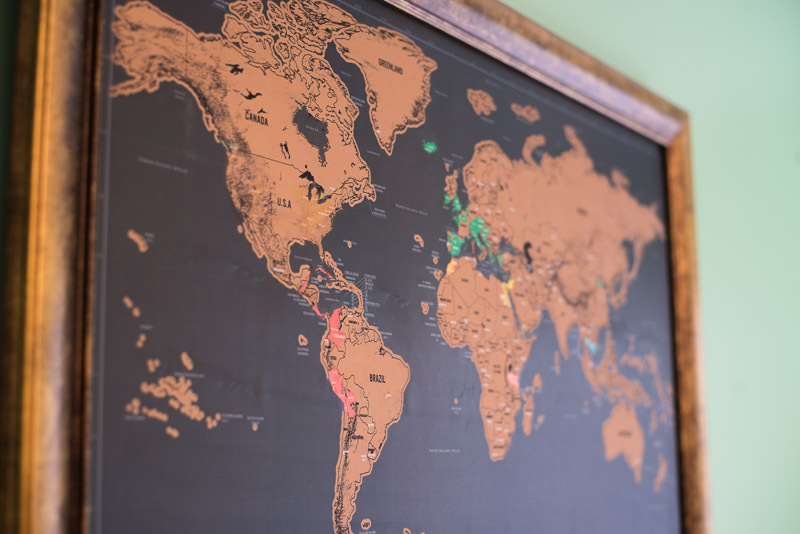 ), pick your own pin colors, and have fun documenting past or future travels. Check out their full lineup of beautiful products! 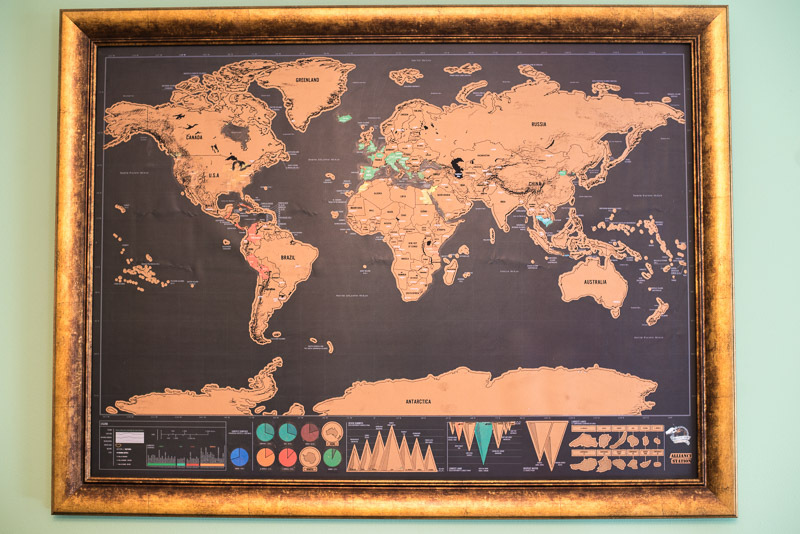 Another favorite is this scratch off map from Luckies of London. It is so gratifying to take a coin and scratch off areas you’ve been to! A few of my students actually got this for me (how sweet??!) and I had a custom frame for it made at Hobby Lobby. It’s a great conversation and statement piece. 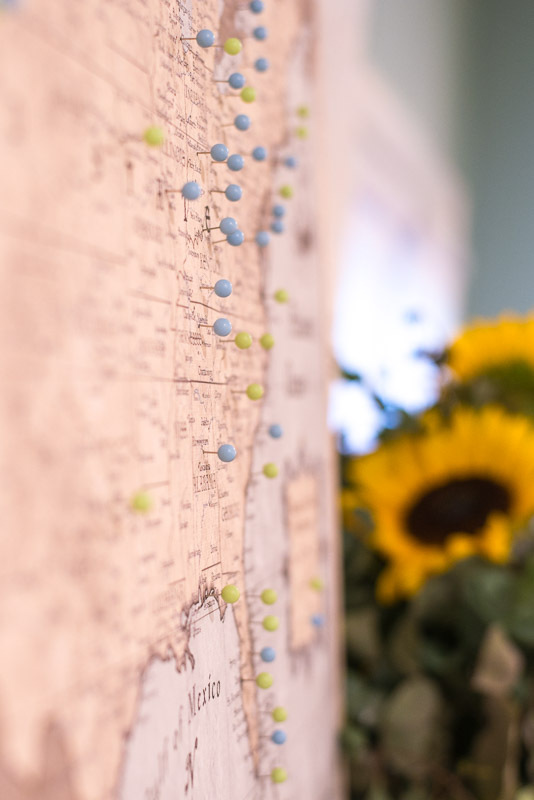 Globes – I’m a little obsessed with globes, if you can’t tell (If you need further convincing, check out my post about our travel themed wedding!). In my experience, the best way to find them is from yard sales or antique malls. The older they are, the more character they have! New globes work too, but maybe not quite as fun! 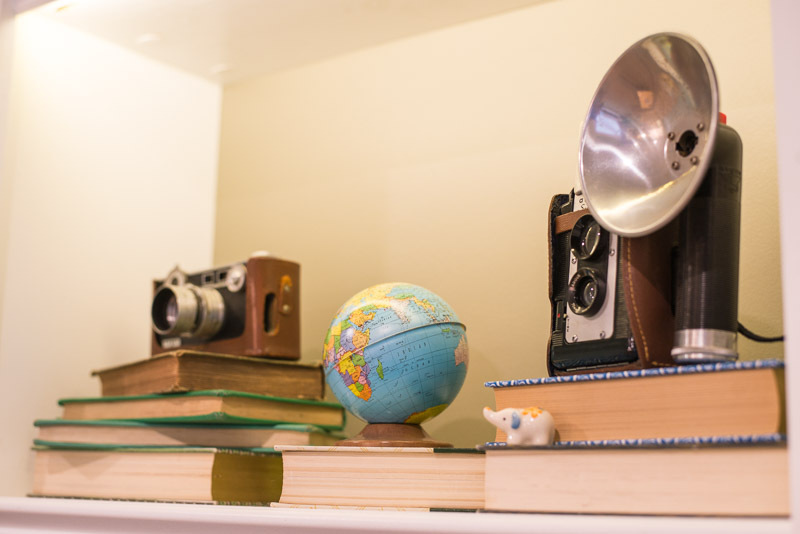 Another great way to give your home a “travel vibe” is to include vintage cameras. For some reason they just seem to fit in with the exploration and adventure theme. Most of ours come from local yard sales. 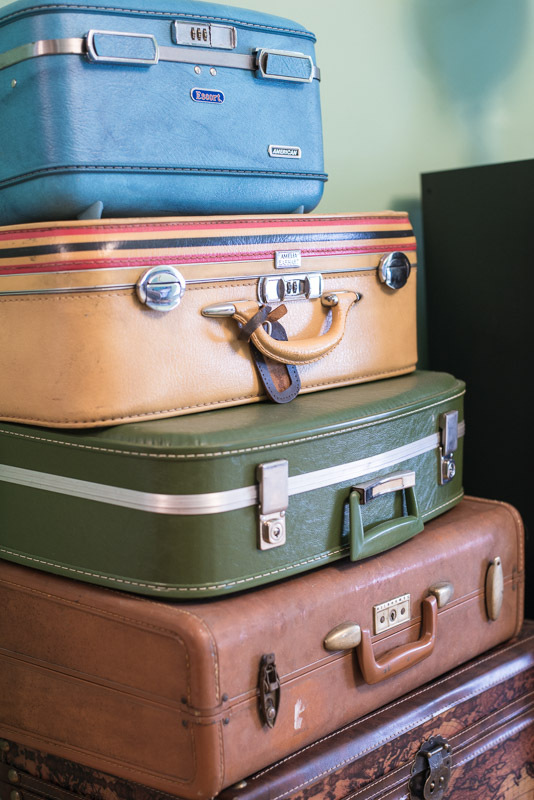 Suitcases- You probably don’t want to use these for actual travel, but vintage suitcases are great pieces to have. We store things like extra blankets or board games inside them too to make use of the space! Stack them, use them as a side table- anything goes! Vintage Travel Books– Yard sales are the way to go to find old travel related books, but you can occasionally find them in online auctions or estate sales. I incorporated ours into my shelf decorations, along with little globes I’ve found too. A personal favorite is my 1920 National Geographic Magazine that I found at an estate sale! 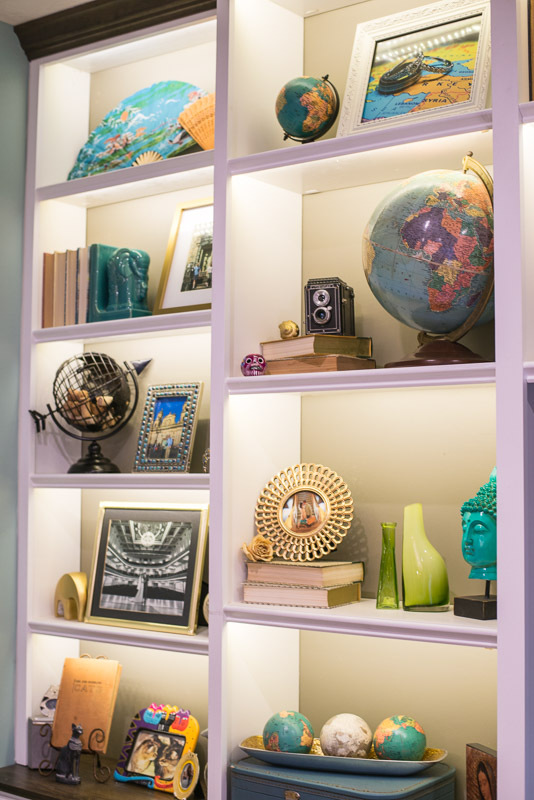 Photographs and Souvenirs– Incorporate your own personal travel photos and souvenir items into your decorations. There are ways to do it without coming across as cheesy. It’s unique, and a great conversation piece. We’re in the process of making a table with a bunch of foreign currency at the moment, but the ideas are endless! I’ve heard of people using postcards on tables, etc. 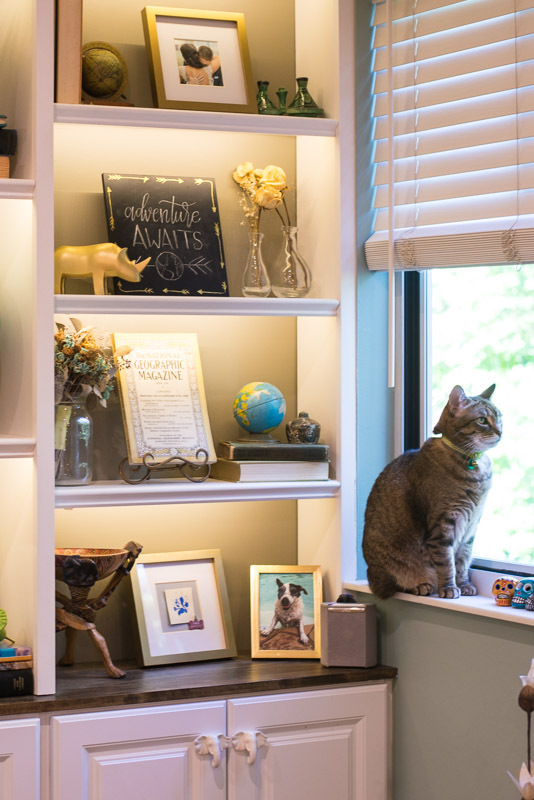 Many of the above items are souvenirs or statues we purchased while traveling. 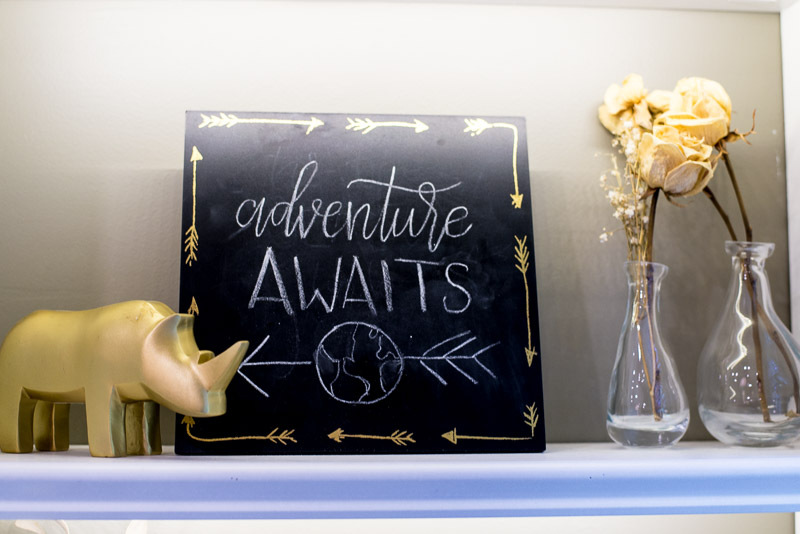 We also framed a few of our favorite travel snapshots as well! This is a beautiful engraved wood piece from a local Kentucky company called Grainwell– they have plenty of gorgeous travel themed pieces! This wall collage consists of photos my husband and I have taken on various travels! 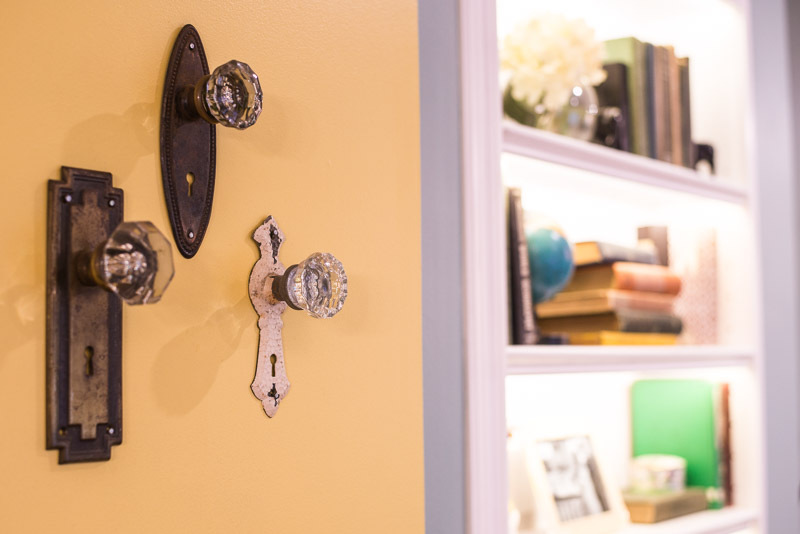 It’s easy to switch these up from time to time if you want to feature different places. 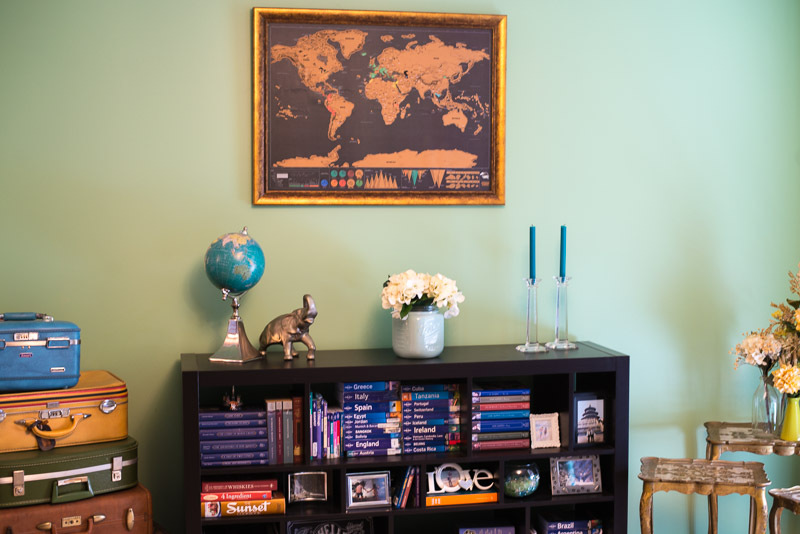 Remember the Memorabilia– Make use of your old travel guidebooks (like my Lonely Planet collection) when it comes to styling a book shelf. It gives you a place to put them after a trip, but also serves as a reminder of the good times! Another idea is to get a “Travel Stub Diary”, where you can display things like old tickets or postcards from previous travels in a cute little book. What do you think? Love it or hate it, let me know! 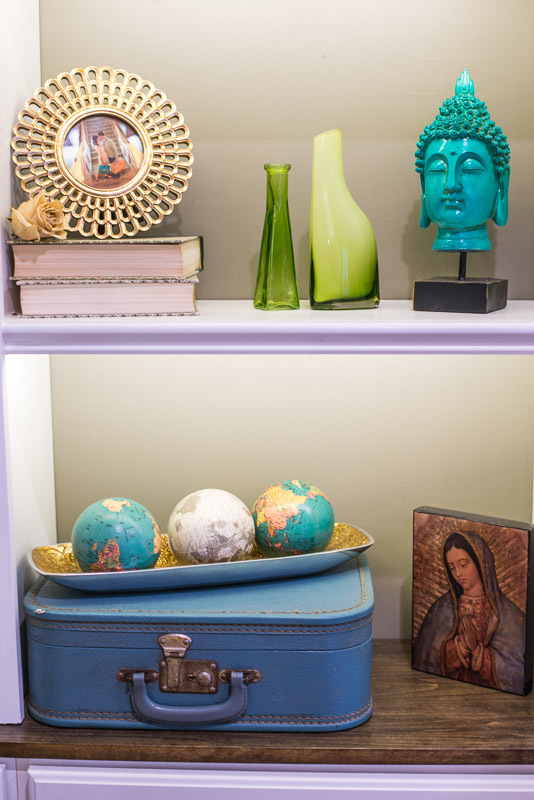 For more travel inspired decoration inspiration, be sure to follow my Pinterest boards! As always, all reviews and opinions are my own. However, this post does contain some affiliate links which means I would make a small commission should you choose to buy any of the products linked. I also received the US map as a free gift for review and promotional purposes. That’s so great, I am at work now but I saved the link so I can study it later, it gives so many ideas! I see you’ve been in Greece, I hope you enjoyed your stay here!